By Takisha Smith—What Is A QR Code? A QR Code (abbreviated for “Quick Response”) is a barcode that contains data that can be read by a smartphone’s camera using a QR reader/scanner. QR Codes can contain information about a business such as a website’s URL, contact information or even social media platforms. By scanning a QR code, you will be taken directly to that business’s information! QR Codes have become increasingly popular in advertising and marketing efforts by small business owners, too. This is an easy and great tool to use on business cards, brochures, brand clothing and other print material. By placing your custom QR Code on the back of a business card, you can generate more traffic to your website by providing easy access to a specific page on your website, Facebook business page or Twitter account. How can I create a QR Code? If you attempt a Google search on “creating a QR Code”, you will get approximately 61,700,000 results displayed. I’ve done the research for you! Create your FREE QR Code here. 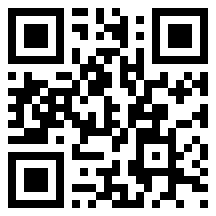 (Yes, this a plug for my website freebie I’m offering now at AfterHoursVA.com) Sign up now and download your QR Code in .jpg or .png format. You can also choose your own colors for a more customized look! What software do I need to read a QR Code? There are a ton of QR Code reader and scanner apps that are available for Android and Apple smartphones and tablets. I personally use QR Reader for iPhone by TapMedia Ltd. It scans QR codes, barcodes, words and even creates PDF files with the “Scan to PDF” feature. Most importantly, it’s a totally FREE app! 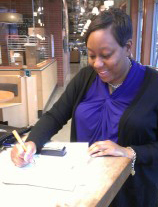 Takisha L. Smith has been a Notary Public and Loan Signing Agent for the Commonwealth of Virginia since 2012. She has 10+ years experience in the insurance, banking, credit card, finance, and investments industries. Takisha graduated from Virginia Commonwealth University with a Bachelor of Science degree in Real Estate and obtained a certificate of completion in Practical Bankruptcy Law from Blackstone Career Institute. Other services include social media management and document preparation for real estate and bankruptcy professionals. For more about Takisha, visit her GGN website.